(PHOTO: Alan King) l-r: Derrick Weston Brown, Evie Shockley, Iain Haley Pollock, and Khadijah Queen. The panel of poets at a Baltimore City Library quietly considered an audience member’s question: “When did you know you were a poet?” Evie Shockley, a presenter, smiled as the response brewed in her mind. She’d been asking herself the same thing until she took a poetry workshop led by Lucille Clifton. If you wrote a poem, then you’re a poet, Shockley recalled the late-poet saying. “Own it and claim it.” Shockley passed on the advice. That question was among the sane ones asked during a Q&A, the most bizarre of any that I sat through. It followed Sunday’s reading at the Enoch Pratt Free Library, which featured four Cave Canem poets who launched their books this year. Among them was Derrick Weston Brown, who kicked the event off with poems from his debut collection Wisdom Teeth (Busboys and Poets/PM Press, 2011). The audience got a glimpse of that pain in Brown’s “Legacy”: “My father’s vocabulary/is extensive but/he still can’t find the words/for I love you/ […] I guess this is why I am/ a poet./ I inherited the words/ lost to his dictionary.” Brown’s words touched the woman sitting next to me, who mm hmmed and nodded. […] some see in this the end of race, like the end of a race that begins/ with a gun: a finish(ed) line we might/ finally limp across,” she read. “for others,/ this miracle marks an end like year’s/ end, the kind that whips around again/ and again: an end that is chilling,/ with a lethal spring coiled in the snow. What’s lethal about Shockley’s the new black is how it blends past and present notions of blackness through verses. It’s an ambitious undertaking that serves as a reminder that our racial past impacts our present moments. And just as ambitious is Khadijah Queen’s Black Peculiar, which looks at how those in power shape perceptions on race and history. “In the 19th century, those unwilling to face the incongruities of a nation espousing freedom while simultaneously perpetuating terror used the phrase our peculiar institution as code for slavery,” according to poet Noah Eli Gordon’s blurb for book. (PHOTO: Alan King) Poets after grabbing some grub (l-r): Tony Medina, Reginald Harris, Khadijah Queen, Bettina Judd, Derrick Weston Brown, and Judy Cooper. Then things took a bizarre twist when two guys in the audience turned the Q&A into a circus. When a presenter asked him to clarify, he couldn’t explain what he meant—just that he enjoyed the works of Amiri Baraka and Fyodor Dostoyevsky. To hear him tell it, contemporary writers—including the presenters—lacked “existential angst” in their work. Khadijah Queen asked him to name one contemporary writer he’d read. Silence. 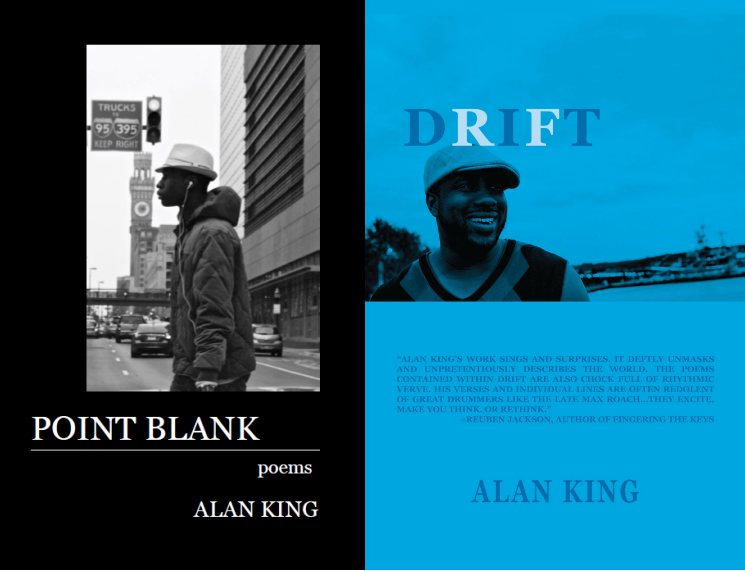 When poets Iain Haley Pollock and Derrick Weston Brown tried to engage him, the guy debated them. Watching that exchange only affirmed why I’m not a fan of Q&As. While they give writers a chance to engage their audience, they also become platforms for “know-it-alls” like “existential angst” man to ramble about nonsense. And, when I thought it couldn’t get worse, the second guy raised his hand. When I spoke with Derrick Weston Brown afterwards, he said the guy’s vibe seemed off. “He came in, sat right up front, and started mean mugging us,” the poet said. The second guy asked the poets if they were still slaves. Up front, the presenters exchanged confused looks with one another. Khadijah Queen was the only one among them who took the guy serious enough to respond. “I grew up in a house where both of my parents were in the Nation of Islam,” Queen said. She grew up listening to Malcolm X’s and Elijah Muhammad’s speeches. “So I’m very much aware of how we’re modern slaves in the way that we have to survive by working for someone else.” The guy, apparently satisfied, got up and left the room. 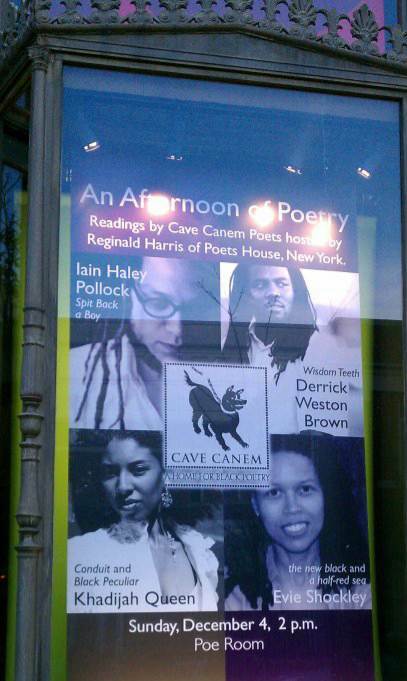 Pollock’s debut collection Spit Back A Boy won the 2010 Cave Canem Poetry Prize. In addition to having two annual book contests, Cave Canem is a summer retreat that Toi Derricotte and Cornelius Eady founded for writers of African descent. Since 1996, emerging poets have had a safe space to take artistic chances. It was there Pollack said that he felt more like a poet. The Q&A’s highlight was a 14-year-old, who asked about finding an audience. It resonated with Brown, who once wondered how his work would be received—that is, until a quote from Pulitzer Prize-winning poet Rita Dove assured him he was doing the right thing. Posted in Essay.Tagged 2011, all, art, books, comedy, community, Culture, education, entertainment, events, family, friends, history, Life, opinion, Poems, poetry, review, reviews, Thoughts, writing. I really enjoyed reading this blog. I wish there were more opportunities in my area to vibe with such inspirational people. Hopefully that will change immediately post-graduation! I look forward to reading more from you. Great post Alan–appreciated the update, photos, and inspirational quotations you preserved! Thanks for the commentary, Alan. I (kinda) wish I had been there. one word….Phenomenal! wish I could have been there as well! Much appreciation for your Blog on this grand event! Thanks for sharing. I wish I could’ve attended! Very nice! Wish I could have been there as well. I love your blog! Thanks for sharing and capturing all the interesting details.